I was looking through my Lightroom catalog for something to post to the blog when I noticed this shot. Originally I wasn’t excited about it. I liked it, but I didn’t think it was special. Still, there was something about it that I found attractive so I spent a little time with some post processing to see what I might come up with. 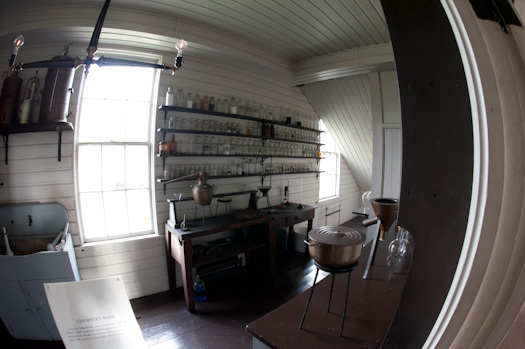 The shot is from Thomas Edison’s Menlo Park Lab building located in Greenfield Village in Dearborn, Michigan. This was pretty much a grab shot as I walked through the building. I bumped the ISO and stuck my camera into this little room and took a couple of shots. I had my tripod, so I could have set up and taken multiple shots for an HDR, but it was getting late in the day and I was getting lazy. 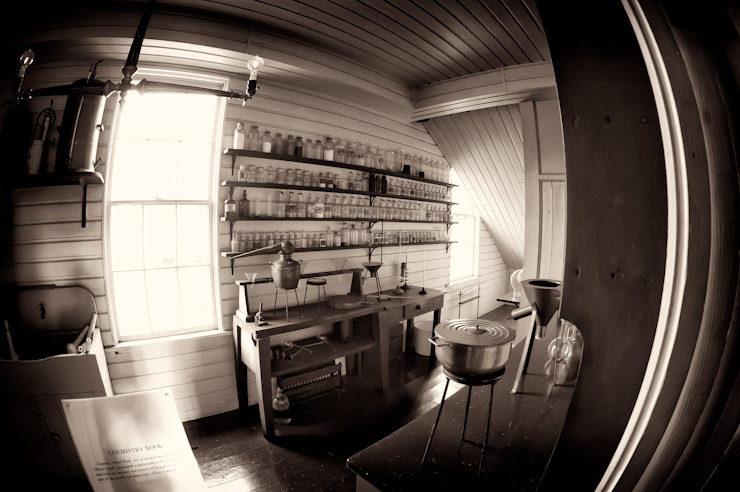 I think the thing that appeals to me is what the fisheye does to the lines in the image. I like the strong curve of the doorframe as well as the curved lines created by the paneled walls. For processing, I initially used Lightroom to reduce the noise in the image. I shot this as 3200 and while the noise wasn’t awful, it was pretty easy to clean up with Lightroom. I then went into Photoshop and used Silver Efex Pro to do the conversion. I again stepped through the presets and came across one that I had created which I call Holga Panatomic X. It’s Nik’s standard Holga preset, which is somewhat dark with a strong vignette, but customized to use the ISO 32 Panatomic X film type. I also added a bit of sepia tone as well. The fisheye creates a nice circular feeling to the image and I think the extra bit of vignette just adds to it and helps bring the focus to the center of the image rather than the edges. What do you think? Comments always welcome. Copyright © 2010 James W. Howe – All rights reserved. The fisheye does give an interesting effect, I love the way the distortion is confined to the edges of the frame.